Childbirth Education in your HOME! At home on DVD For some couples, the the classroom setting simply isn’t possible; no classes in their area, inconvenient timing doesn’t work out, or maybe child care challenges. The classes on DVD are a great option for these couples. The couple will receive 12 DVDs each providing the lecture from class, the nutrition, exercise and relaxation segment. They each also have a testimonial from a mom or couple who had their baby through the classes and the impact it had on them. Each DVD has a PDF file that can be printed out on your computer that corresponds with the classes. 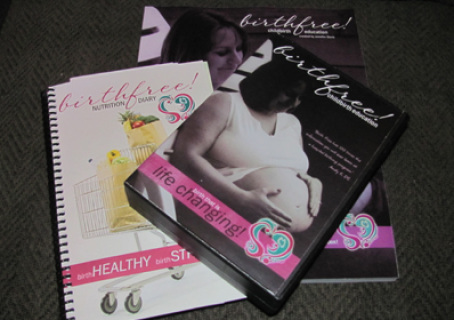 A bonus to the DVD course is that you can use them to prep in future pregnancies at no added costs. 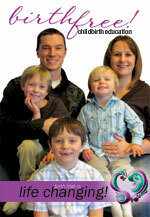 The DVD classes provide you with 12 DVDs to use for your current and future pregnancies. They offer 12 weeks and 24-30 hours of work both on and off the videos for only $300 or just $25 per class! Individual DVDs can be purchased for very specific learning. The individual DVDs are $35 each. 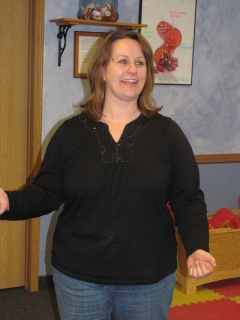 Each class includes handouts that relate to the lecture topic of the week, including information specific to nutrition, exercise and relaxation topics. They also include healthy recipes for pregnant moms, a birth story, a devotional, homework and a place to journal. The DVD and on-line e-classes include an invitation to an exclusive facebook group for students to connect and learn with. For students choosing to go the DVD or e-class route, personal consultation time with the instructor through phone or skype is available for an additional $75 fee. Each student purchasing this package will receive 30 min. per week (day and time set up individually) for them to use if needed. If the student chooses to not use it, they will still pay the fee for having the teacher available. Each student purchasing this package will receive 30 min. per week (day and time set up individually) for them to use if needed. If the student chooses to not use it, they will still pay the fee for having the teacher available. DID YOU KNOW … that 40 weeks of gestation is an AVERAGE? DID YOU KNOW … that when the baby is ready…she or he will tell mom? DID YOU KNOW … that labor tends to last a FULL day? DID YOU KNOW … your body can birth without your active participation? DID YOU KNOW … that labor doesn’t have to be painful? DID YOU KNOW … that your body makes it’s own pain meds? YOUR ATTITUDE AND YOUR EXPECTATIONS of your birth is what decides the outcome. Watch your words and thoughts carefully, guard them, protect them, embrace them! And honor your body's design...and it's designer! What is one thing that mom has control over in her pregnancy that can help keep her healthy, provide for her unborn baby, keep her low-risk and in turn provide her with options in her pregnancy, labor and birth? Her eating habits! Our dietary choices have a significant impact on our health and our baby's health. In week two we talk about a pregnancy diet that has been proven to keep mom healthy and reduce her risk of pre-eclampsia and toxemia. You will discover ways to incorporate healthier choices into your diet and ways to make it fit your budget a bit easier. The bottom line with nutrition is its impact on your pregnant health is far more important than many realize. The mom who is healthy is labeled low-risk and that mom has choices, the mom who is high-risk, has far less. Ask any mother who has carried a baby in her womb if she felt a connection between herself and her unborn baby and you will likely get a resounding yes! Mother have known, since the beginning of time, an intimate relationship with their unborn child. For some, it's an active relationship. For others, it's a quiet, subtle one. Science is starting to catch up with what mothers already know. Babies are aware of us. They react to our emotions, energy and very beings. In week three, we will explore this connection, this relationship with mom and baby. We will also look at the monthly growth and development that baby, mom and dad go through as they travel along the path of pregnancy. Labor pains, they are highly feared, talked about in stories of great intensity, and most women are encouraged to go out of their way to avoid them or run from them. But what if, just what if, they were given to us for a reason, that we experience them for a reason, being part of our design? When a woman learns to understand the mechanics of labor, when she learns to surrender to the intensity of the contractions, when she discovers that the birth of her child is is far greater than herself, she becomes a mother whose bond with her child is unbreakable. Labor, while it can be intense beyond any intensity ever experienced elsewhere, it is given to us for a reason. When mom embraces it, she grows from it! The second and third stages of labor are the stages truly of birth. This is the time when the baby and the placenta are pushed out. For many women, the act of pushing is like a reward for all the hours of labor when they wanted to "do" something, but could only hold on during the contractions. For other women, these stages are a time of challenge as they allow their body to open up to it's ultimate expanse to release a child. While the labor contractions are intense and require much relaxation, pushing is the ultimate of submission to something quite large. The way a woman's body allows the release of a child is truly a miracle! Equally amazing is the third stage and the release of the placenta, an organ that seemingly appears out of no where to bring life to your child! This is BIRTH, real and raw! Dad's can be a vital component to the birth of their children. When a child is born, not only does mom's life flip over, so does Dad's. The more prepared Dad is, the better he can help in labor and more importantly, throughout their children's life. It's very common to see the bond that Dad creates with his child in birth cement their relationship for the many days and years to come! Many moms who prepared actively with their partners in pregnancy speak of dad's role after the birth as being vital. They say words like "I couldn't have done it without him!" "He was the greatest coach!" "I 'could' have done it without him, but I am so glad I didn't!" Dad's often feel lost or confused at birth, but with a little preparation and communication prior to the "big day", Dad will feel much more prepared and excited to play an important role in the birth of his child! Induction, medications, extraction and ultrasound. These things, while very common in the obstetric world, are often very misunderstood. Moms and families often consent to medications and treatments they have only the most superficial knowledge of. If families had more of the facts concerning the risk of these things, the occurrence and usage of these elements would likely decrease significantly. There is a use for all these tools and when used appropriately they can be of utmost value. But...do most moms and families have all the tools and education necessary to make these decisions safely? I challenge you to learn more first before doing something you can not reverse. Cesareans, VBACs, breech babies, multiples, genetic screenings, cord around the neck and gestational diabetes. It seems like the list never ends. Once again the question must be asked, how much does mom and her family know before having to make serious decisions about these common variations. Cesareans, did you know the World Health Organization recommends a national rate of 10-15 percent? Less than 10% implies that there are moms and babies hurt or dying because of lack of technology. While more than 15% shows that moms and babies are hurt or dying because of an overuse of technology. Do you know where the US stands on cesarean rates? A big, whopping 32%! My goodness, that means one in three? Will it be you? As newborns, humans go through probably the most complex transition of their life. Changing from a being living in water, to an air-breather, talk about a serious transition, and that's just the start of things! When your baby is born, there are many things you will need to consider, things like the antibiotics placed in your newborn's eyes, the heel prick test, the vitamin K injection, and circumcision are just a few of the many considerations. Moms are so excited to meet their babies, many eagerly accept an induction just to meet baby a tad sooner then if they had been patient and yet caring for your baby is never easier than it was while they were in the womb. The postpartum period is a time of great joy and interesting transitions. When a baby is born, so is a mother! Transitioning from a single person to being two, the mother-baby is a huge adjustment, to say the very least! As mom enters the postpartum period, even if it isn't her first child, she is entering a time significant transition. This period can be so beautiful and yet it can be so painful. When a mom can surround herself with family and friends who are able to lift her up, support her, and help her along the way, this interesting time in her life, can be a wonderful one! As women these days, we try to "do all" and "be all" for those in our lives. We have troubles slowing down and even more importantly, we have troubles asking and accepting help. This may be one of the biggest reasons moms have troubles transitioning in the postpartum period. It is okay to ask for help and it is ok to accept it. By allowing others to aid us as we transition, we teach our children that it's ok to seek help...a very valuable lesson for all of us! Benjamin Franklin once said "failing to plan is planning to fail". Now using the words "fail" in regard to birth is not necessarily the best of words, but I hope the message is clear. When you take the time to learn all you can learn prior to a big event, an important event, a life changing event, you are planning. With birth you can not plan, to: A, go into labor on such-and-such day. B, have a particular gender. C, dictate the length of the labor process, and yet by learning all you can learn ahead of time, taking that knowledge to your care provider and discussing your options, you discover the realm of possibilities as you move closer and closer to the day of your baby's birth. You should never refer to a birth as a failure, but there is failure to take responsibility for your birth, there is failure to communicate your desires with your care providers there is even failure to prepare yourself for the changes in store for you. Thankfully educating yourself prior to your birth is planning for success! Mommas milk, the most perfect food for our babies! Why then do we see so many babies drinking formula out a bottle? We know that breastmilk is perfect in every way. Breastmilk is a live substance, changing from feeding-to-feeding depending upon the needs of the baby. It helps with future dental issues for baby, it allows them to experience their full IQ potential, babies breastfed have fewer illnesses including ear-aches and colic. The benefits don't end there, either. They benefit mom as well. Mom has a lower chance of breast cancer if she has nursed her baby, she loses weight easier and generally delays the return of both her period and her fertility. With proper support from educated lactation counselors, supportive La Leche League meetings, and friends and family, nursing the baby could be the easiest, most precious gift a mother could ever give herself and her baby!